Having spent 14 years of my life in New York City, I, like most New Yorkers, consider myself a pizza aficionado. In the mid 1970s, my family lived in the East 70s, in an old apartment building that was fortuitously just a few steps away from what I’m told was one of the very first Original Ray’s Pizza parlors in the city. Even now, I can see that corner building, painted the colors of the Italian flag, and smell the amazing aromas of freshly baked pies coming out of the ovens. Those wonderful pies were my first. And since then, I’ve happily and unhappily eaten my way through hundreds of slices, good and bad, all over the planet. Fortunately, my wife S enjoys pizza as much as I do. While I was away in Hong Kong, S, her friend Baker L, J and my brother W decided to try their hands at making their own pizzas. Because a friend had reported success using a pizza dough recipe from Martha Stewart’s Baking Handbook, they gave it a go. They also tried a recipe for Napoletana pizza dough from a pretty amazing book, Peter Reinhart’s American Pie: My Search for the Perfect Pizza. This book, which I’ve since flipped through, chronicles Mr Reinhart’s search across Italy and the United States for the perfect pizza. The first third of the book is pure editorial. The rest of the book contains fantastic recipes culled together by this talented baking instructor and award-winning cookbook author. This past weekend, S and I hosted a few friends for dinner. One of them is a passionate young food blogger whose posts we’ve enjoyed reading this past year and whom we’ve enjoyed getting to know via email. We were really looking forward to cooking for her. Another of our guests, a really close friend who very sadly will be moving from Singapore to Switzerland later this year, is a fellow pizza lover. Like us, he likes crispy pizzas with a thin crust. Eager to put her newly-acquired Miele baking stone to the test, as a second course of our dinner, S put together a lovely pizza margherita with some piquant Spanish pork sausage that a colleague had generously carried back for me from a recent work trip to Madrid. (S had a little bit of trouble getting the sticky Reinhart base to slide of the peel, but the crust turned out crisp and mouthwateringly browned.) The rest of the dinner was also good. We started the meal with a very retro prawn cocktail. After the pizza we served a deboned milk-fed veal osso buco, made with a recipe from Joyce Goldstein’s Italian Slow and Savory, plated over some risotto a la Milanese. For an avant-dessert, we made Michel Richard’s egg soufflé, followed by an orange cake with some amazing ice cream flavored from a spice mix amusingly called “abracadabra”. I’ll write more about both the ice cream and the cake in a future post. I’ve decided not to copy the Reinhart pizza dough recipe. While easy to make and using very few ingredients, the recipe itself is lengthy. Because of the number of steps required, it covers almost two and a half pages. I’d also encourage all of you to buy a copy of Reinhart’s book for yourself. I will have to pick up Reinhart’s book. I made the Martha Stewart pizza dough a couple of weekends ago and the pizzas came out pretty well… but I don’t yet have a stone and did not getting any lovely browning. My toppings started to get too overcooked before the dough was really done. Your photo looks delicious as usual. That pizza looks absolutely fantastic. When I made the pizzas the first time around, I didn’t have a baking stone either. But the trick is to pre-heat the oven for 1 hour (yes, this is no typo) at its maximum temperature setting. I then placed the dough on a dark coloured baking tray lined with baking paper and placed it directly on the floor of the oven. This helped to brown the pizza crust and we didn’t have problems with ingredients getting overcooked. My baking tray warped, of course. Stunning specimen! On a completely shallow note, I also love the grain on your chopping board – may I ask what wood it is? If ever you are in Montréal, Québec, you must try the pizza. Unlike NY, but just as special, it a taste of my childhood I’ve not been able to replicate in Ontario. Thank you to S for the concise reports on the dough – she has inspired some experimentation! Heya CH! It’s been awhile! I had tried making homemade pizza once with a newly bought oven, but it turned out quite disastrous, although edible..
What happened was, when we started baking the pizza with the toppings on top, some of the toppings gave out liquid/juices which softened the crust and made it a little mushy in the end.. It must’ve been pizza in the air indeed 🙂 I will have to get Peter Reinhart’s book and experiment. Dough can be so subjective and I have yet to perfect that part of it myself. Definitely going to Amazon to get the book. You must’ve enjoyed many pizzas in your days in NYC! What a gorgeous pizza. I, too, have fallen head-over-heels in love with ‘American Pie’ and the crispy, chewy delights therein. It even prompted me to run out and buy a pizza stone – which is now covered in burnt topping residue as it took me several tries to get the pie off of the peel face up! I love NYC pizza. I think it’s the best! One of the schools I attended was located in the East 70s. I think it may have been the same Original Ray’s Pizza that you mention. Used to have pizza almost everyday for lunch! 😉 *sigh* The good ole days! That story sounds remarkably similar to mine! Do you have any tips to offer? I am so relieved to hear that I am not alone. My first reaction, of course, was to think that I’d just wasted bucketloads of money on acquiring the baking stone since all I wanted to eat were those incredibly sticky when unbaked Reinhart bases I’d fallen in love with. Please, please say that there’s a trick to this that I can master with practice. Try using a pizza pan with big holes on the bottom, the bigger the better. The pizza base should be in direct contact with the pizza pan to give it a brown crust. Dust the pizza base with flour before putting it onto the pizza pan to prevent it from sticking. Do not oil the base as the high heat will somehow turn the oil into a gooey mess and stick to the pizza pan base. S is right about turning on the oven for one hour. I would even suggest longer if possible to give the oven a higher heat load to cook the pizza quickly. It works perfectly well with the pizza pan placed on the rack in the middle of the oven. Don’t overload the pizza with ingredients. It will “sit heavily” on the dough and prevent it from rising and giving it a crust. Less is more when putting on ingredients. Hope the tips are useful. Hi S, I’ve also tried sprinkling some semolina on the pizza stone before putting pizza on to bake and it works quite well (although I haven’t tried this extra-sticky crust before). I make sticky doughed pizza and bread all the time and there is an answer. Parchment paper is your friend, even in a 550 degree oven (pizza). Just trim the paper to the size of the crust with a tiny piece extending to grab and tug. I usually put the paper on my peel, build it there and transfer to the oven. Where it cooks on a 16-inch square of unglazed tile from the local Lowe’s, cost $1.29. No fuss, no muss, no overturned pizza mess. Plus, crispy. Good to have you back! Great post as usual. Thought of you when my friend tipped me on Uberburger, a gourmet burger joint at Millenia Walk. Apparently by the same team at Courduroy & Finch. the only time i’ve made pizza from scratch, dough and all, was when visiting a friend in SA who had an outdoor pizza oven they wanted to test out. he made his first and then i rolled out my dough and started piling the toppings on. incredibly silly of me since we didn’t prebake the crust a bit so it wouldn’t take as long…. but it turned out well. i took some left over beef fillet slices and mixed it up with a spicy indian curry. chopped up a little red onion and spread some cilantro pesto as the base sauce. not exactly what my hosts had considered as a pizza option but loved nonetheless. and i’m not surprised at all about heating your oven for a solid hour beforehand. we had a professional pie maker with us and for the stone pizza oven we were supposed to have had a fire going in it for a solid 6 hours beforehand…. Thanks for all your tips. I did, in actual fact, use parchment paper with a couple of left over portions of dough I had put in the freezer. Unfortunately, they turned our chewier. But I suspect that that had more to do with freezing it? Or the fact that CH loaded enough ingredients for 2 pizza bases onto one wee base. We have a pizza pan with those holes, but haven’t gotten round to using it yet. Will pull it out when I make my next batch of pizzas! I will also have to hunt some semolina down. Tara, I haven’t forgotten about your questions. I just can’t for the life of me remember what kind of wood it is. I remember it smelling beautiful when we first bought the chopping board (we’ve added another 2 to our collection because we love them so much). I will need to just look it up. Maia, I’m going to Uberburger this weekend while CH is on the road. Heh, heh. The owner is a friend of ours. 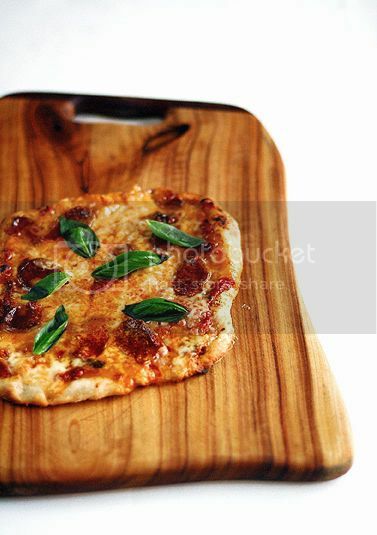 Chubby Hubby, I would be eternally grateful if you could tell me where to buy a pizza stone in Singapore, I have been looking for the past 2 years! We bought ours at Miele (Winsland House II). There seems to be a small pizza-specific oven on the market these days too. Shermay’s Cooking School has a class that uses it.